phpList 3.3.6 is now available to install, and introduces public categorisation of lists to subscribe pages, several fixes, and minor improvements. See the Download page for installation and upgrade instructions. 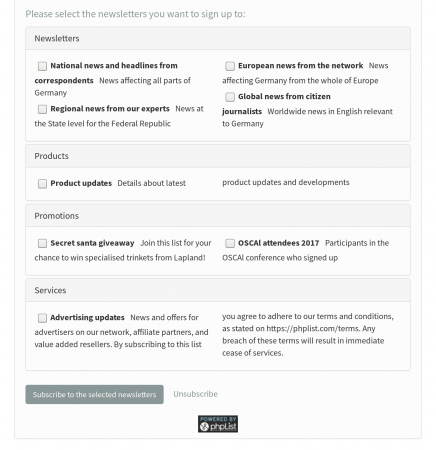 A new option to show lists organised by categories on subscribe pages. Categories from the existing list categorisation system can now be shown on public pages, making it easier for subscribers to navigate between lists grouped by theme. Categorised lists are shown within an accordion interface element using a responsive two column design. Thanks to CPS-IT for proposing and sponsoring this feature. Public categorisation can be enabled system wide, or for individual subscribe pages only. The setting is off by default. Provide error message when a subscribe page accessed via Ajax doesn’t exist — thanks to Michael, see the pull request. Add link to source code of phpList from the about page.